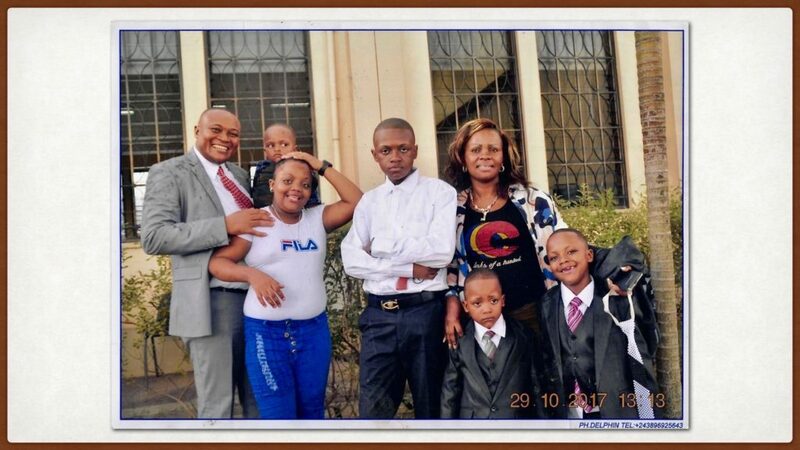 The Congolese saints are on the whole a faithful and obedient people. 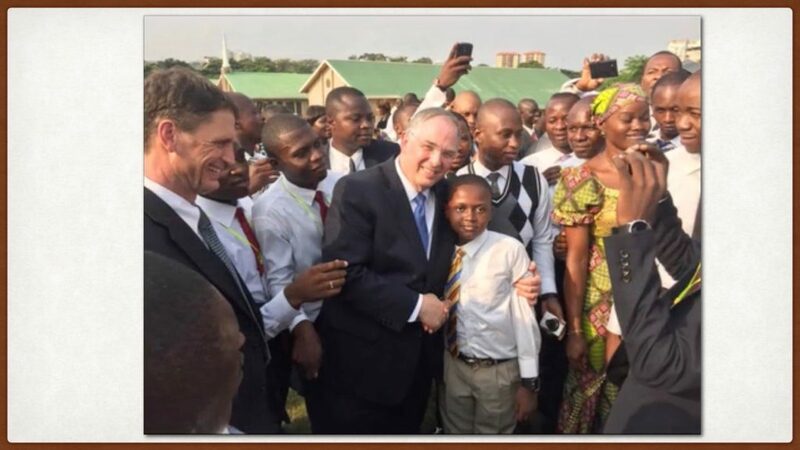 This is epitomized in the fact that, according to Elder Joni Koch, the DR Congo Kinshasa mission is not only among the fastest growing in the world, but also has the highest rate of sacrament meeting attendance — double the percentage of a typical stake in the United States. Quiet evidence of this faithfulness and devotion is to be found everywhere. 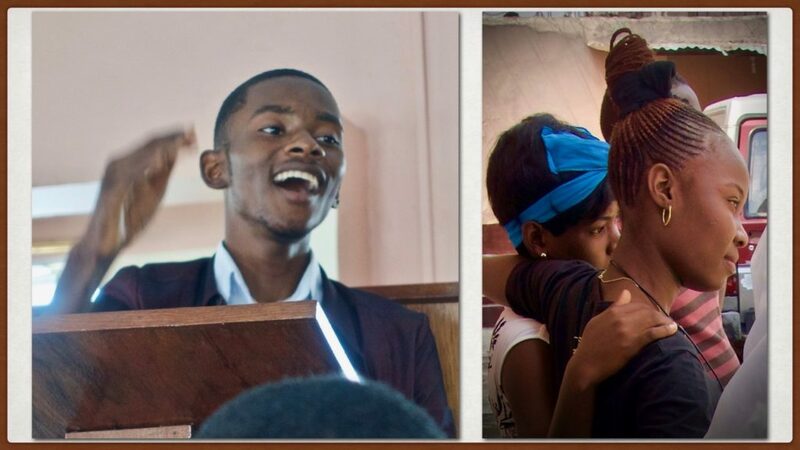 While waiting for a meeting in the mission office, Brother Tito Tshibanda quietly made notes on a beautifully printed document of perhaps twenty pages. I asked him what he was doing, and he said it was a draft of the plan that had been drafted by their ward council for the coming year. As a counselor in the bishopric, he was adding some personal suggestions before the plan was finalized. 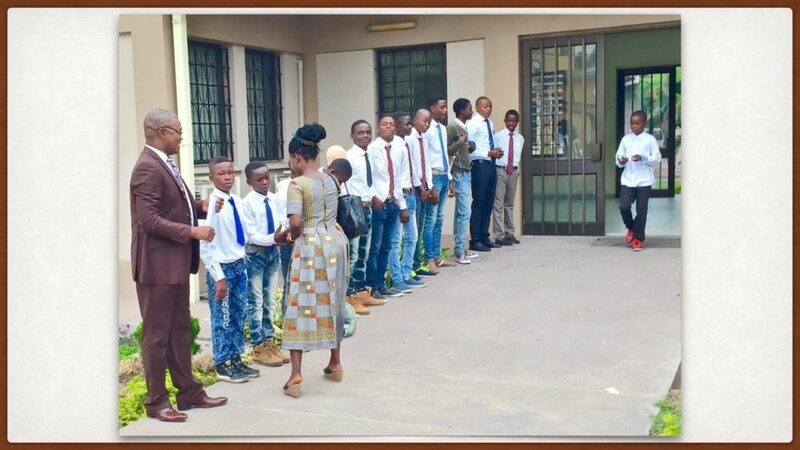 We enjoyed shaking hands with the young men of the Aaronic priesthood who came early to line the walkway with Bishop Aimé Ngoy and greet the members of the ward before sacrament meeting. 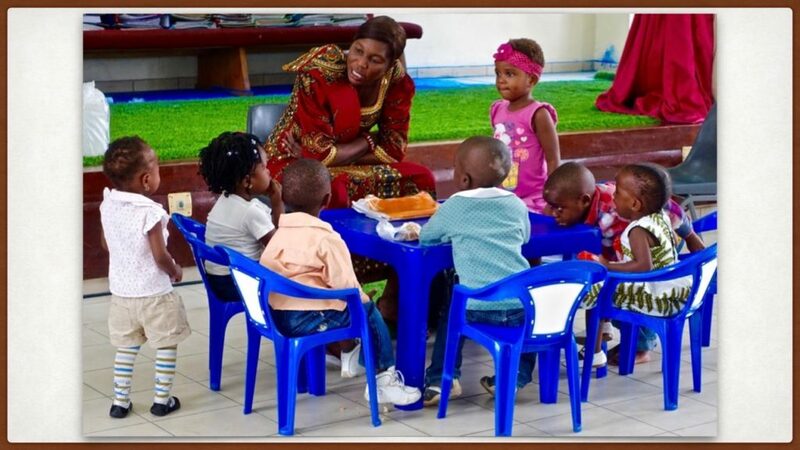 We loved the innocence of the little children and the dedication of their teachers. We were thrilled with the joy of singing the hymns together with heartfelt enthusiasm and the evident love these Saints had for one another. In the mission office, we regularly received visits of members of the Church from remote areas of the mission that had no organized branch in their city or village. Because of difficulties in sending these donations by other means, they often came long distances to bring their tithes and offerings in person. 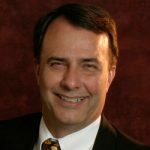 Pascal Lomboto, a beloved associate in the mission office, serves as a bishop. 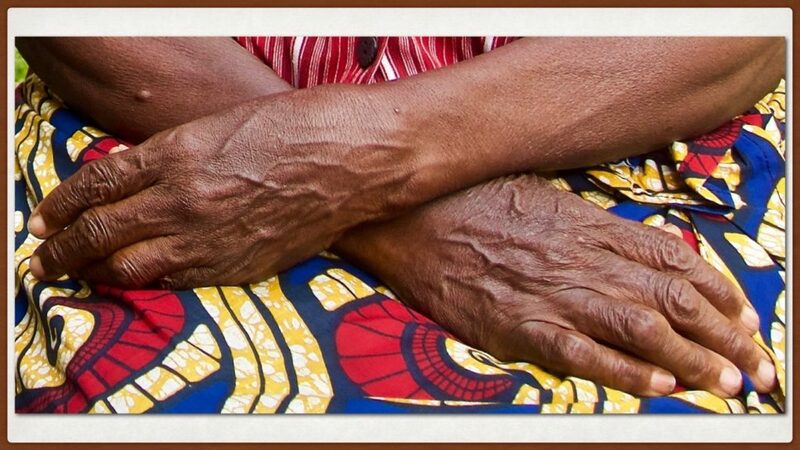 He told movingly of the example of a widow in his ward who walked long distances to be at Sunday meetings each week and to pay her tithes and offerings. He said that 60% of the people in the DR Congo — particularly those who live outside the major cities — live on a dollar or two per day and that 90% eat only one meal per day. 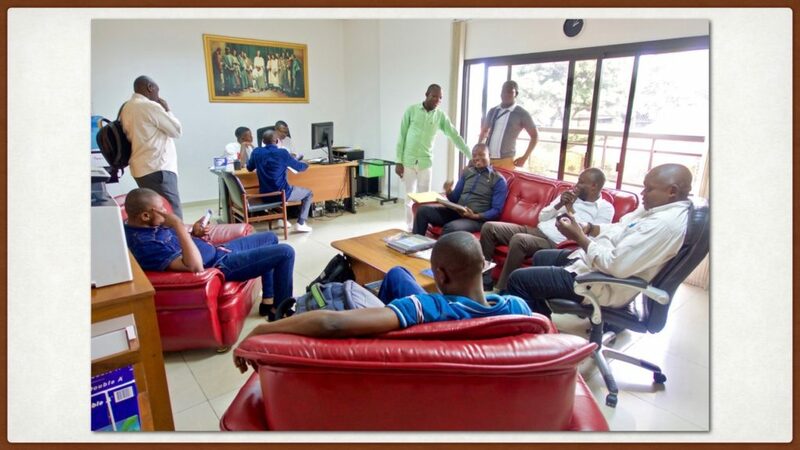 One day there was a vigorous discussion in the mission office among a group of local brothers who were waiting to meet with Bishop Pascal. They were discussing the passage in the Handbook of Instructions 2 where members are taught that “proper fast day observance typically includes abstaining from food and drink for two consecutive meals in a 24-hour period.” Some who only ate once each day had been wondering if their fast should last 48 hours rather than the prescribed 24 hours. Fasting for 48 hours would allow them to fast and donate the equivalent of “two consecutive meals” to the poor. Bishop Pascal assured them that a 24-hour fast was sufficient. Doctrines and principles relating to the family play a very important role in a place where marriage and children are so highly prized. 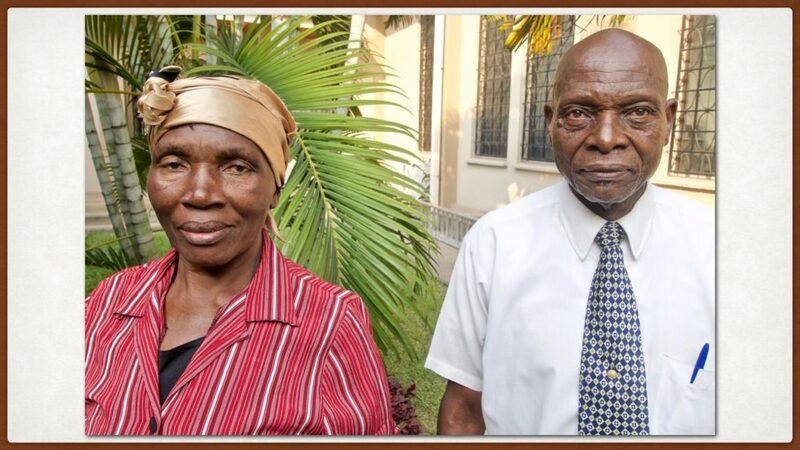 Brother and Sister Milambo have been faithful members of the Church almost since its beginning. Brother Milambo served as the first stake president in Lubumbashi, the most important city in the DR Congo after its capital, Kinshasa. Here, as a traditional sign of respect, Brother Milambo poses for the photo not by looking directly at the camera but instead by gazing in deference at the wife he loves and honors. They have been married for over sixty years. Sister Milambo became a bride at age twelve. Nowadays, the marriage of young children is rare. 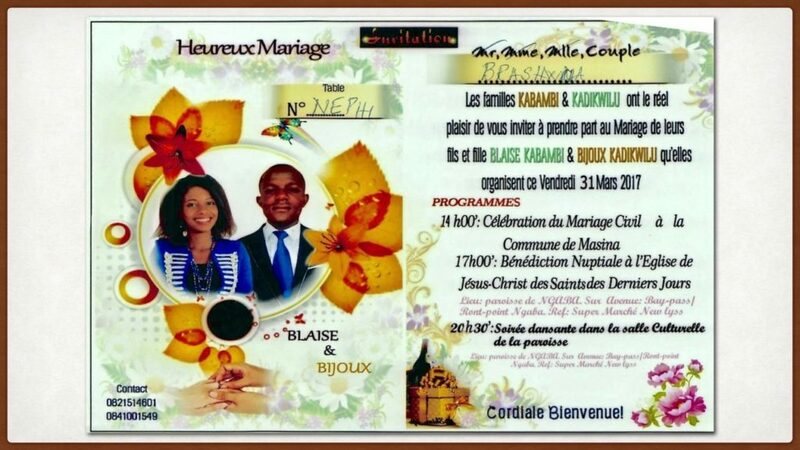 This is the invitation we received to the reception of Bijoux Kadikiulu, a sister who served in our mission, who was about to marry another returned missionary. 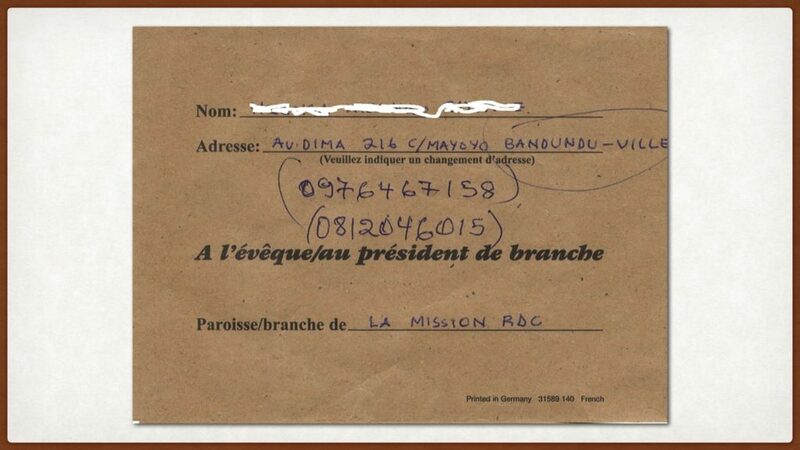 Marriage in the Congo is still a complex business. Typically, families insist on traditional marriage ceremonials that precede the civil marriage, including a substantial dowry. For some, the traditional marriage is sufficient. However, the Church, in addition, requires a civil marriage before a church marriage at the meetinghouse can take place. Temple marriage in the Johannesburg South Africa temple follows the civil marriage, as soon as circumstances permit — including the considerable expense of passports, visas, airfare, and lodging. 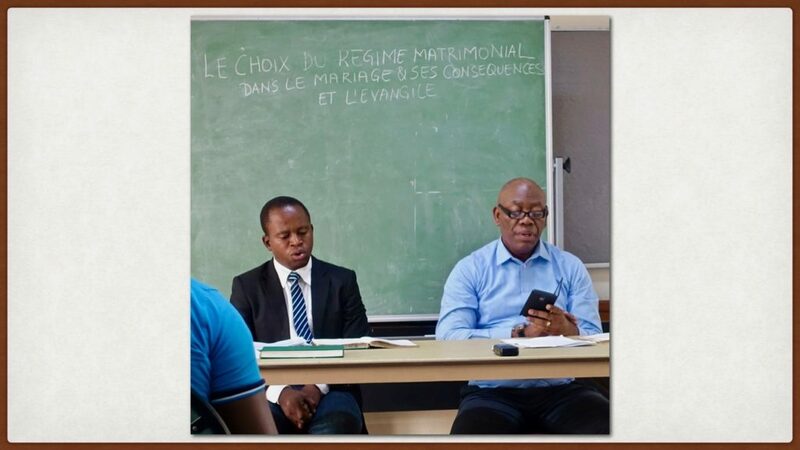 The various implications of marriage law are sufficiently difficult to comprehend that our ward held a two-hour fireside featuring Bishop Aimé Ngoy, Brother Stan Kalala, an expert on Congolese marriage law, and Brother Daddy Kampoy, a seasoned church leader, to explain their details to young adults. A persistent concern relating to marriage throughout Africa is the requirement of large marriage dowries — essentially a bride price. The Church teaches members that dowries are harmful and degrading to women, lead to couples postponing marriage and family, and handicap them financially as they are trying to make a start in life. Eliminating the practice is difficult because even if a member couple wants to do away with these traditions, extended family can exert great pressure on them to conform. 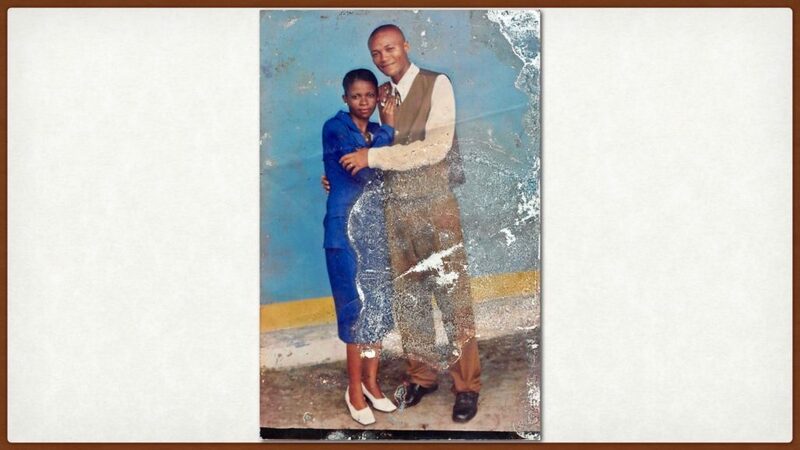 The courtship story of Thierry and Nathalie Mutombo that follows is an example that runs in countercurrent to traditional dowry practices. 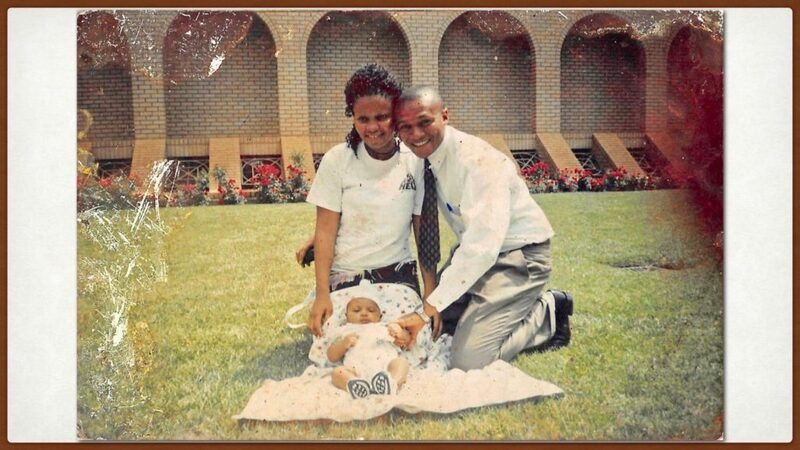 Thierry comes from a faithful LDS family whose members now span three generations. Here Thierry and Nathalie’s son Jason Kalombo Mutombo is shown with Elder Neil L. Andersen at the groundbreaking of the Kinshasa temple. 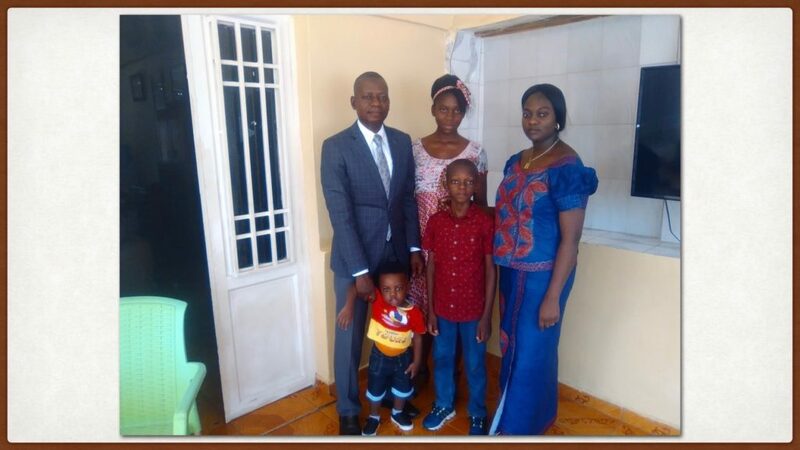 Thierry’s father (at left) and mother (shown at right with Thierry and his little sister Fifi) had each attended many different churches, but a dream about the Book of Mormon settled the question for his father — he knew he had found the truth. 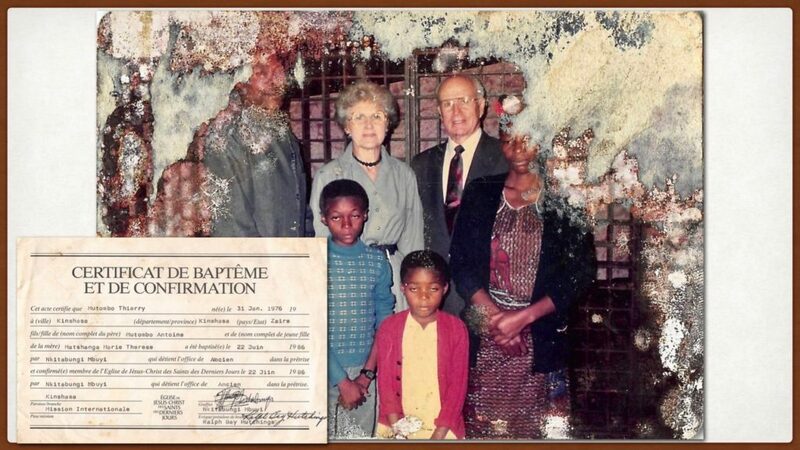 Thierry was baptized, along with his father and mother, in the cold waters of the swimming pool of the Hotel Okapi on 22 June 1986. This was only the second baptismal service to be held in the country. 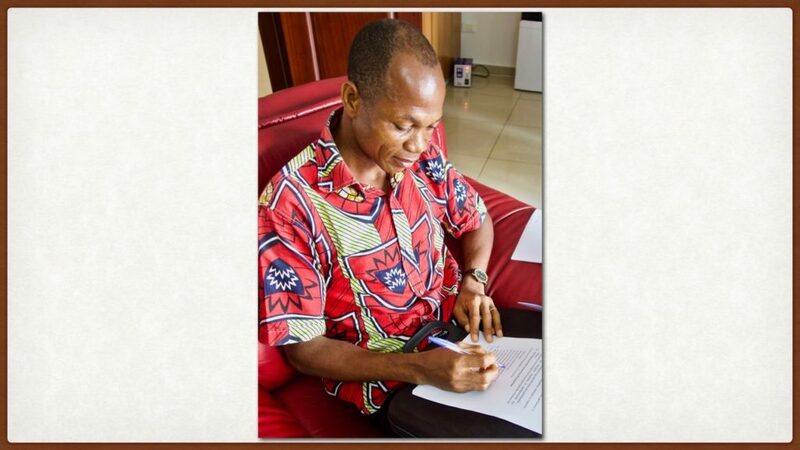 After returning from a mission to the Ivory Coast, Thierry began to prepare for marriage. His mother was the first to mention his future wife to him. 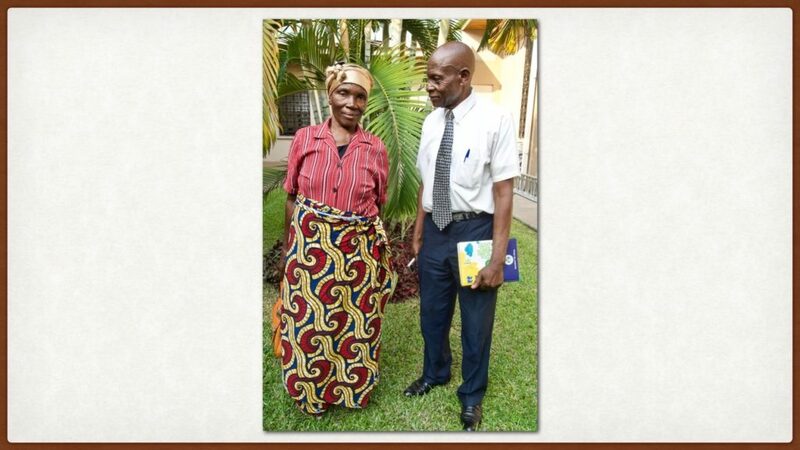 She said, “We have an exceptional missionary serving here, Sister Sinda. She’s very nice, she’s unbelievable. If, one day, you found a way to marry that sister I would be the happiest woman in the world.” But Thierry’s mind was on other things at the time and he didn’t follow up. 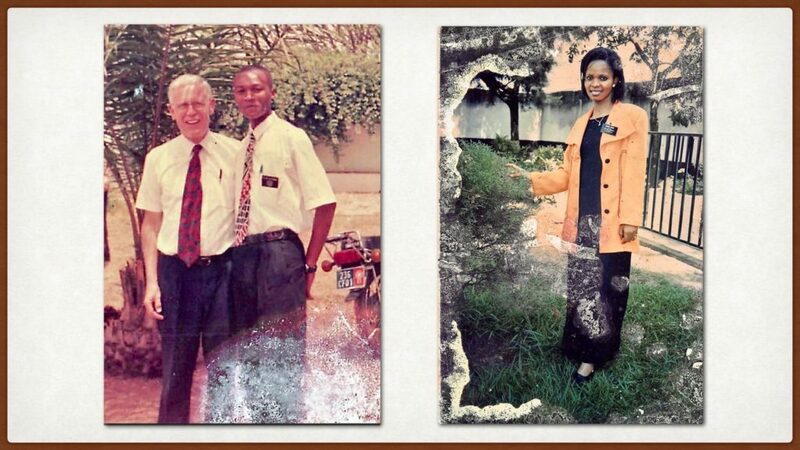 However, one day a former missionary companion convinced him to come along on an outing and, unexpectedly, he found himself at Nathalie’s doorstep, the day after she had returned from her mission. Thierry and Nathalie hit it off and before long began to make marriage plans. Nathalie was an orphan and her uncles were responsible for her upbringing. They asked for a very large dowry. Thierry went to his father with the little money he had saved from working here and there, but his father said: “No, no, no. You can’t go to them with that. 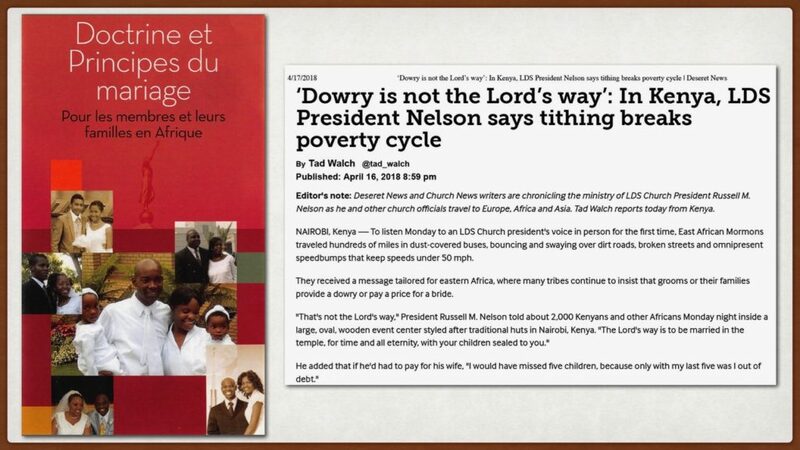 They won’t accept it.” Nathalie and Thierry continued to make large sacrifices to buy little things on the long list of dowry items the uncles had given them. Thierry again went to his father and pleaded with him to write Nathalie’s family the formal letter that would allow them to start negotiations. It had gotten to the point where the couple felt they had no more they could give. Finally, Thierry’s father relented. [After the civil marriage,] the members of the ward organized something. The brothers of the Elders Quorum bought some juice. And the Relief Society sisters made beignets [similar to scones] along with some little sacks of peanuts. And those were the refreshments for our marriage. The lesson I learned … is that we need to focus on what is most important. And for me, the most important thing was my marriage to my wife. 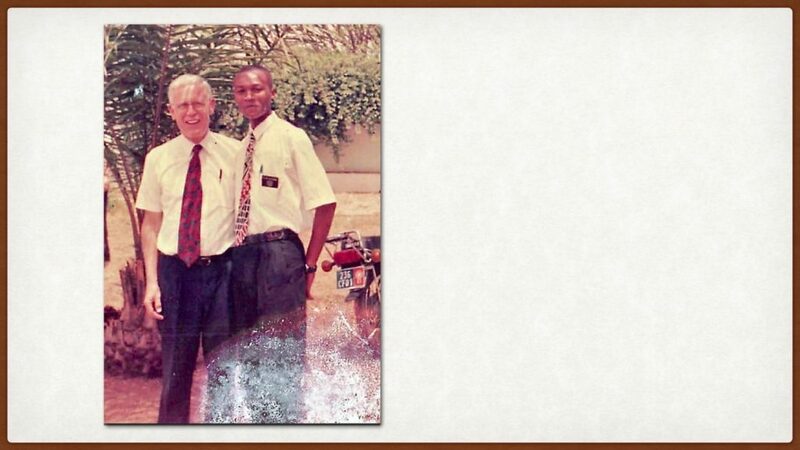 In the spring of 2018, Thierry was released from his call as president of the Masina stake. That summer, he began service as the president of the Baltimore, Maryland mission. Some of the material in this article has been adapted from oral history interviews. 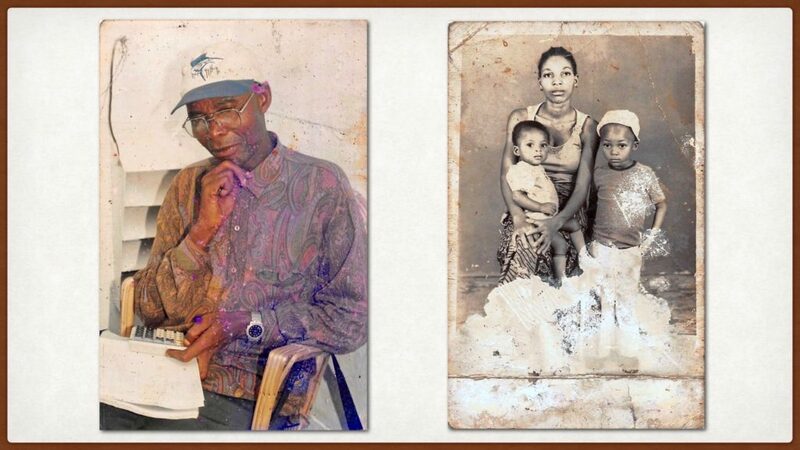 My sincere appreciation to Tito Tshibanda, Pascal Lomboto, Brother and Sister Milambo and to Thierry and Nathalie Mutombo and their family for sharing their inspiring stories and for reviewing the material in this article. Thanks also to Matthew K. Heiss of the global support and training division at the Church History Library for his encouragement and support in the publication of this story, and for affirming permission on behalf of The Church of Jesus Christ of Latter-day Saints to use oral history-related material found in this article. Church Handbook of Instructions, Volume 2, 21.1.17.